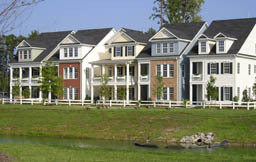 This unique community featured two-story and three-story townhouses with alley-loaded one and two car garages. For the three-story designs, the second floor was the main living level and included large balconies in front. Although the models were attached at the first floor, the upper floors were pulled away from the party wall to provide a detached appearance and added privacy. All four models were 28 feet wide and ranged from 2,500 to 2,900 square feet. The three two-story models were between 24 - 35 feet wide and ranged from 1900 - 2044 square feet. They also featured expansive balconies on the front elevation.